The 100 reveals what happened during the often mentioned “Dark Year” as the various factions prepare for the inevitable War that looms on the horizon. 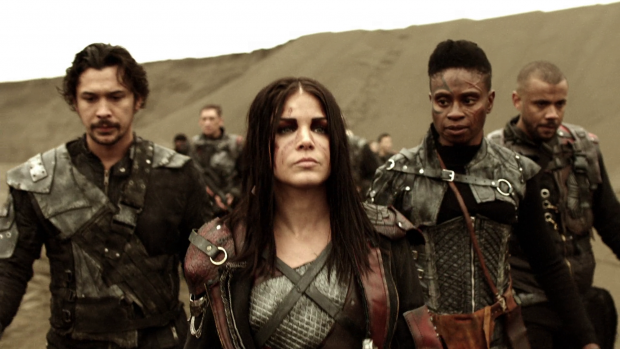 Last week may have ended with Octavia leading the march to violently take Shallow Valley but it’s a journey that takes days on foot so this leaves ample time for the characters to prepare while reflecting on the decisions that have brought them to that point. In a lot of ways this is a season about leadership, choices and consequences so it makes sense that the characters would take stock of their own choices especially when they might be about to take actions that they will regret for the rest of their lives. Are they fighting for the right reasons? “The Dark Year” has been mentioned repeatedly in hushed foreboding tones without going into detail about what happened there. It comes across as if the characters are ashamed and disgusted with themselves over what happened during that period and it was clearly definitive for Octavia as it was instrumental in turning her into the brutally uncompromising leader she currently is. This episode digs into those events and starts to add context to Octavia’s current mindset as well as Abby’s addiction. Abby’s addiction acts as the lens that allows exploration of “The Dark Year”. Clarke is helping her detox rapidly which comes at great risk as it’s possible that her heart could stop. Abby is motivated to beat the addiction for the sake of her daughter but at the same time her dependency allows her to live with herself after what happened and the part she played in it. It’s no secret that resources were strained in the Bunker during the 5 years that Wonkru were stuck in there. Flashbacks allow some context of how strained the resources were with the mention of the only protein source being temporarily lost. They will recover but it will take a year for that to happen so an alternative needs to be found. Unfortunately the only other potential source of protein is the bodies of those that lose their lives during combat in the pits. The fact that cannibalism appears to be the only option is a clear indication of how bad things were at that point. Ethically eating the flesh of dead people is unthinkable but the alternative is total starvation for an entire population of people. The choices made during the flashbacks become definitive for Abby and Octavia in really profound ways. 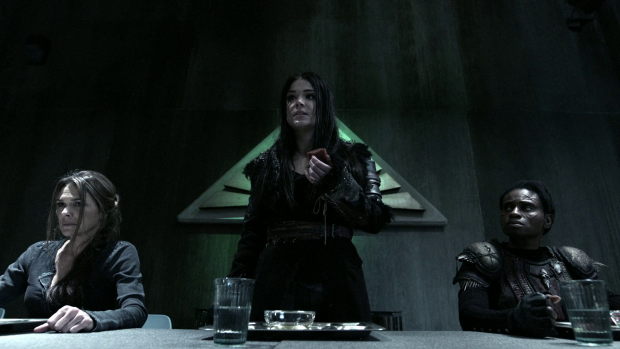 Octavia is shown to be compassionate as she argues against eating the dead out of respect for them. They may have been sentenced to fight for their lives but Octavia clearly sees that as a dignified death given the circumstances so using them for food flies in the face of that dignity. There’s also a great deal of revulsion on her face as she imagines what she would become if eating the flesh of her own people is something she became comfortable with. Despite Octavia’s reservations Abby’s argument is a logical one. The flesh of the dead is the only available source of protein and if it isn’t consumed by the living then everyone will die of starvation. There is absolutely no other choice so it’s an unthinkable situation. It’s easy to see why Abby would become addicted to pills as pushing Octavia towards that solution would be a very difficult thing to live with so wanting to escape that makes sense. Abby willingly resigned herself to a self medicated existence where she wouldn’t have to deal with the pain associated with her guilt all the time. It’s basically a self inflicted blissful ignorance that became the only way she could.live with herself and it’s only with some distance from that as well as the motivation to be a better person in the eyes of her daughter that she actively wants to beat it. Octavia’s coping mechanism was to cut herself off from her humanity in order to distance herself from the horrible decisions she was responsible for making. It’s wonderfully complex as she talks about honouring those who gave their lives in the arena and recognises their deaths as being a sacrifice made for the good of Wonkru but at the same time it seems like she devalues human life by willingly sentencing people to death knowing that they will end up as food. In short she forgets that she’s eating people because it’s necessary for the survival of her people. For better or for worse Octavia leads by example. She takes the first bite and encourages everyone else to do the same. Later it becomes clear that many of the people don’t want to eat the flesh of people they know and care about so for the sake of survival Octavia has to go along with Abby’s suggestion to enforce this as a necessity. Octavia makes an example of those who refuse by killing them and it’s enough to scare the people into doing what she deems necessary. It’s another example of ruling through fear while acknowledging that there is no right answer that allows the moral high ground to remain intact. The choice is either survival through questionable means or widespread starvation so there is no way for anyone’s conscience to be clear in this situation. The knock on effect of this is of course very significant. Wonkru are basically going to War on false pretences because they are motivated by fear. This could mean that there is little in the way of actual loyalty to Octavia save for Indra. We’ve already seen examples of people trying to set up Madi as a replacement and Bellamy tells her in this episode that he isn’t fighting for her. This automatically puts them on the back foot as very few people seem to be clear what they are actually fighting for beyond being told to. They did knowingly reject a viable alternative last week at least on a small scale but I wonder if there will be significant losses because they aren’t motivated to fight for Octavia. Madi is starting to process the wisdom of the Commanders and contextualise the wealth of knowledge she now has access to. It creates a minor role reversal between her and Clarke that allows Madi to dispense advice and see the situation from a different perspective. Her simple observation that Clarke is on the wrong side of the War is very illuminating as it suggests Madi has become aware of Clarke’s tendency to get lost in her own sense of idealism and she is definitely not thinking clearly because her priority has become helping Abby overcome her addiction. Madi’s development does feel like it’s happening a little too quickly considering how much difficulty she was having with the memories that were following into her mind but on a conceptual level this is great stuff and it ties Madi into the overall mythology in a very real way. Echo, Murphy, Shaw, Emori, Raven and Diyoza have started to establish themselves as something of a guerilla fighting force who recognise they’re outmatched by McCreary and his followers but will also work to do what they can to even the odds. This was great but I wish there was more of it. Murphy’s simple declaration that McReary’s men can’t attack them with what they don’t have was a perfect summation of how he intends to approach the problem and Diyoza’s realistic prepartion for this eventuality adds onto what is already known about her. Other details like Echo and Bellamy speaking another language in case anyone overhears their plans shows how competent everyone involved is. Raven and Shaw sharing a kiss on the eve of battle feels earned as well. There was so much here that was rife for development that was sadly short changed by a lack of real attention on it. Another strong episode that provides fascinating insight into Octavia and Abby by clearing up the mystery of “The Dark Year”. As a justification for Abby’s addiction and Octavia cutting herself off from her own humanity as well as her people it works really well because what they felt they had to do warrants those sorts of reactions. The episode handles the concept of cannibalism really well with a clear understanding that it was the only way to survive but still not morally right. 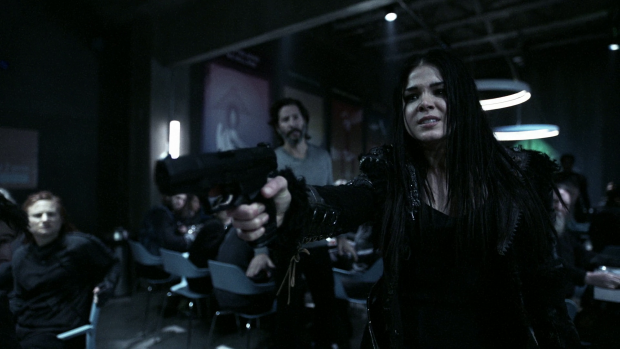 Octavia is the one who had to enforce it which leads to further bloodshed and suggesting it had to be enforced is why Abby is currently the way she is. It’s a brutal and uncompromising situation that the episode does a great job of bringing across. Madi gaining the wisdom of the commanders is another thing that works well because it acts as a role reversal for Clarke and Madi which allows Madi to be the one to dispense advice and help Clarke see that she has become somewhat blinded by her own idealism. 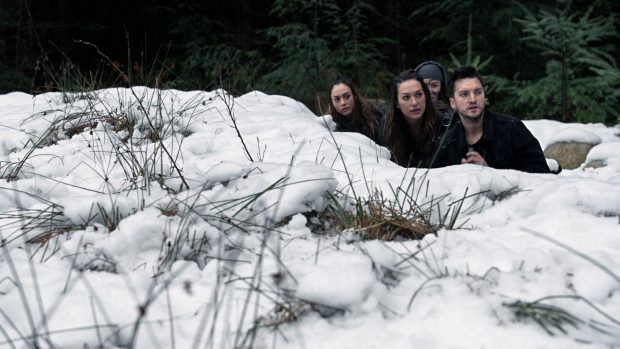 The group made up of Echo, Murphy, Emori, Raven, Shaw and Diyoza are really interesting because they all play to their strengths to create a group of guerilla warriors. Echo and Bellamy communicating in another language in case they’re overheard shows intelligence, Diyoza is further developed as being intelligent and well prepared even if she is no longer on top and Murphy’s simplistic approach to stealing weapons makes for a great use of his character. Raven and Shaw sharing a kiss on the eve of battle feels earned as well. The problem was that not enough time was spent on this group to take full advantage of the fascinating dynamic at play but it was great nonetheless.